Few midsize cars have more to offer than the 2018 Honda Civic Sedan! According to the writers at The Car Connection, the new Civic Sedan offers “sharp style,” a “stellar safety record,” and “impressive fuel economy,” for an “incredible value.” Once you’ve explored the technology features offered across its five trim levels, you’ll have no trouble seeing why! In this vehicle, next-generation safety features are equipped alongside entertainment features the whole family will enjoy and convenience features that you’ll never tire of using. Find out why so many of your friends and neighbors have great things to say about the new Civic by reading on below! These days, there’s no reason to settle for a midsize car that fails to offer superior safety technologies. Despite the Civic Sedan’s affordable price tag, impressive safety features are available on every trim level. Multi-Angle Rearview Camera: This camera lets you alternate between wide-angle, normal, and top-down viewing modes as needed! It comes standard on every model, and on the EX trim and up, its standard guidelines are replaced with dynamic guidelines that move with you. Honda LaneWatch: In EX models and up, just activate your righthand turn signal to view a live feed of your righthand blind spot! The feed comes from a camera mounted on your side-view mirror, and shows on a centrally located console screen. Advanced Compatibility Engineering: ACE body structure allows the Civic Sedan to stand up to collision forces that would wreak havoc on other small cars. A clever combination of collapsible and rigid frame materials makes the Civic Sedan stronger and safer than competitors, and this technology is standard on every trim. 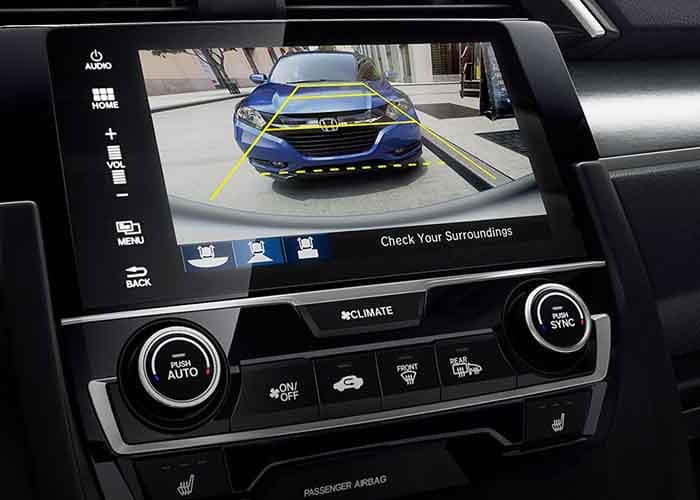 Honda Sensing: The celebrated Honda Sensing safety package includes a Collision Mitigation Braking System, a Lane Keeping Assist System, a Road Departure Mitigation System, Adaptive Cruise Control with Low-Speed Follow, and several additional automatic warning systems. Don’t Miss Out on Entertainment Features! Generations of fun-loving drivers have hailed the achievements of the Honda Civic, but the technology features in this year’s sedan model is sure to exceed even their highest expectations! Drivers who choose this midsize car will possess easy-to-use driver interfaces, high-fidelity audio, and much more. 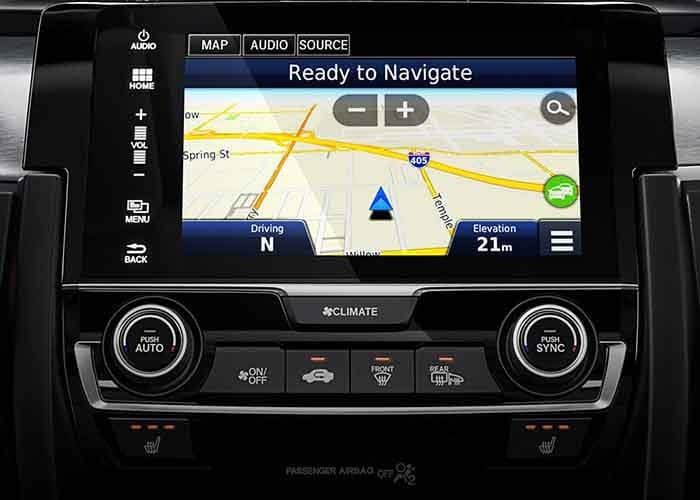 7-Inch Display Audio System: On the EX trim and higher, this screen replaces the LX’s standard 5-inch color LCD screen. This technology makes it easy to access and control your favorite features using its responsive and customizable touchscreen buttons. Apple CarPlay and Android Auto: Get the most out of your smartphone’s music library using either Apple CarPlay or Android Auto. With either interface, you’ll be able to explore and play music from a compatible device using the Civic’s built-in buttons. Incredible Audio: LX models offer a 160-watt four-speaker audio system, while EX, EX-T, and EX-L models include a 180-watt eight-speaker system instead. Those who upgrade all the way to the Touring trim level will receive a stunning 450-watt 10-speaker Premium Audio System that even offers a subwoofer! No matter where life takes you, your Civic Sedan will give you the tools and technologies you need to take care of business. SMS Text Message Function: No driver wants to be distracted by text messages while they’re behind the wheel. In the Civic Sedan’s EX trim or higher, you’ll possess an SMS text message function that can read your messages aloud as soon as they hit your phone. Your hands can stay planted firmly on the wheel. HondaLink: The HondaLink smartphone app is compatible with every Civic Sedan model except for the baseline LX. Notable advantages offered by HondaLink include 24-hour roadside assistance, detailed vehicle guides, service appointment reminders, and a location-saving parking reminder! Honda Satellite-Linked Navigation System: Every driver knows that easy access to turn-by-turn directions can make every journey a whole lot easier. 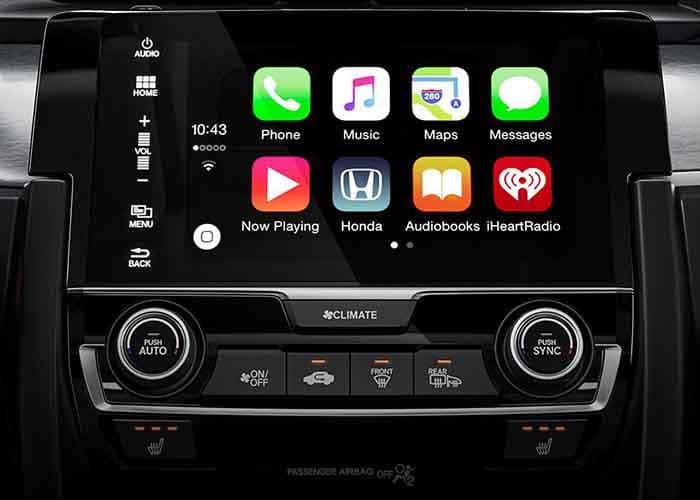 In the Civic Sedan Touring, your standard navigation system will offer Honda HD Digital Traffic updates, voice recognition, and Song by Voice convenience! Remote Engine Start and Smart Entry: All you have to do to get on the road in a hurry is approach your Civic Sedan with your key fob on your person. Using this technology, you can get your engine running before you ever leave the house, and have your doors lock and unlock automatically. Getting the most out of your next new car is easier than ever. The technology features in the 2018 Honda Civic Sedan make it an exceptional option for drivers in Hampton Roads, and when you take advantage of our current offers and financing options, you can take this midsize car home for a great price. Contact us today to learn more about your options and to schedule a test drive at your local Hampton Roads Honda Dealer.